This year the Christmas party will be better than ever and this year they will have a total of 83 kids. So that means that they need a lot of support to deliver that much cheer to the kids. It will be a fun day with a photobooth and a visit from Santa! More details can be found in the link above. Cost: 65,000 won per person. Please RSVP in advance. 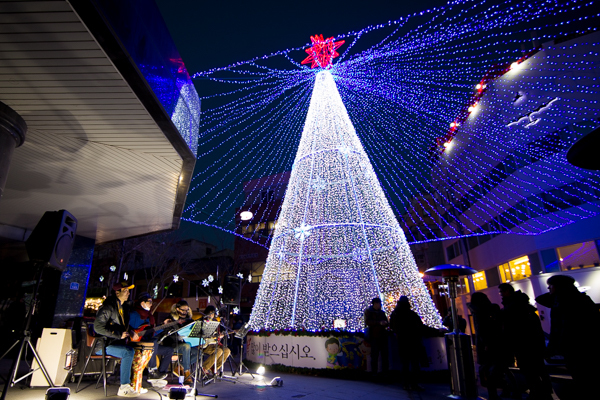 Guests are encouraged to purchase a 20,000 won gift for the secret santa event. The last Digit show before a 2 month break. Bands include Genius, Say Sue Me, and Mountains. Santa will be there to hand out gifts for the children. Pictures with santa can be taken as well. Possible gift exchange for the adults as well. Call Kevin 010-2452-1355 or check the link for more details. JJ’s will be showing Christmas movies and serving up some eggnog made from scratch. Nog and white russians will be on special. JJ’s will also be throwing a New Years Eve Bash as well. Cima will be having their Christmas party on Saturday, December 20th. They will have the infamous Wheel of Booze, Free Shot every hour on the hour, starting at 11:00! 500cc draft of hite for 3,000 won and all cocktails and shots for 4,000 won. For the New Years Eve Party on the 31st, they will have the “New Years Eve” Wheel of Booze, Free shot on the hour starting at 10:00pm, Free Champagne toast, 3000 500cc draft of Hite, and 4,000 won cocktails and shots. Pub HQ will be serving a traditional Christmas lunch consisting of Turkey, roast potatoes, Christmas pudding and much more. The bar will be open later for more adult beverages. KUMFA is the Korean Unwed Mothers’ Families Association and they need your help this year to bring a little cheer to some people who really need it. Details can be found in the link above. Please consider helping as the women are doing the best that they can to help their children and sometimes they need a bit of help, especially during the Christmas season. Donation details can be found in the link above. T-Hope has always done it’s best to help those who are less fortunate than us. Their annual Christmas Party puts smiles on the faces of children who really need it. This year they have a “gofundme” site set up to help raise funds for the party. In a country where everyone wants a perfect “family” many of these wonderful children have been pushed aside. Take some time and help these children know that no matter what they are loved. Donations can be made through the link above.